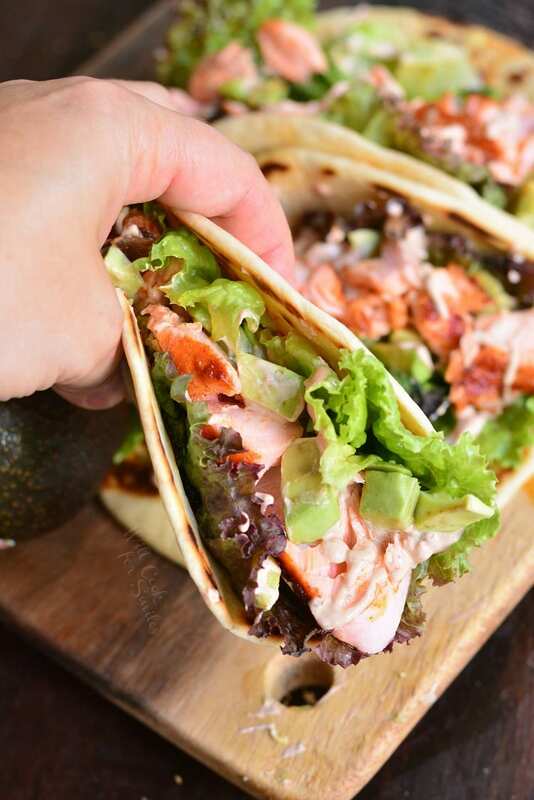 These easy baked salmon tacos are made in 30 minutes and will make a great lunch or dinner. 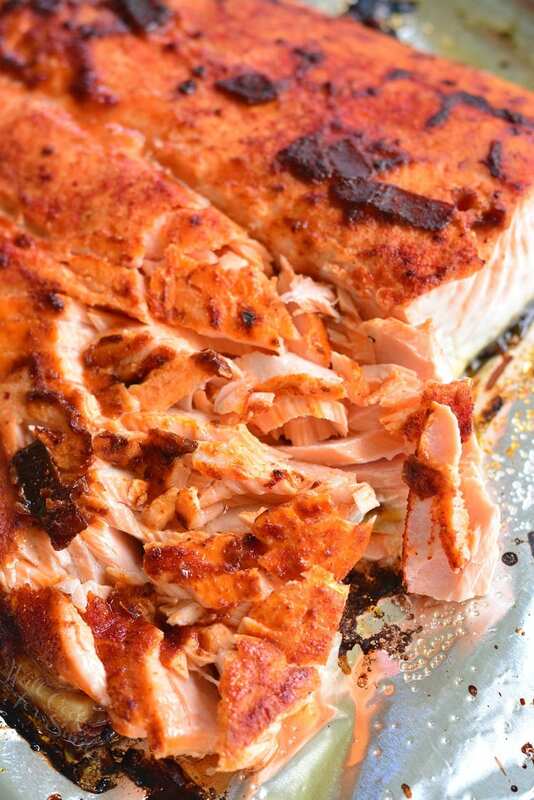 Juicy, flaky salmon is rubbed with a mixture of spices and Chipotles in adobo sauce and baked. 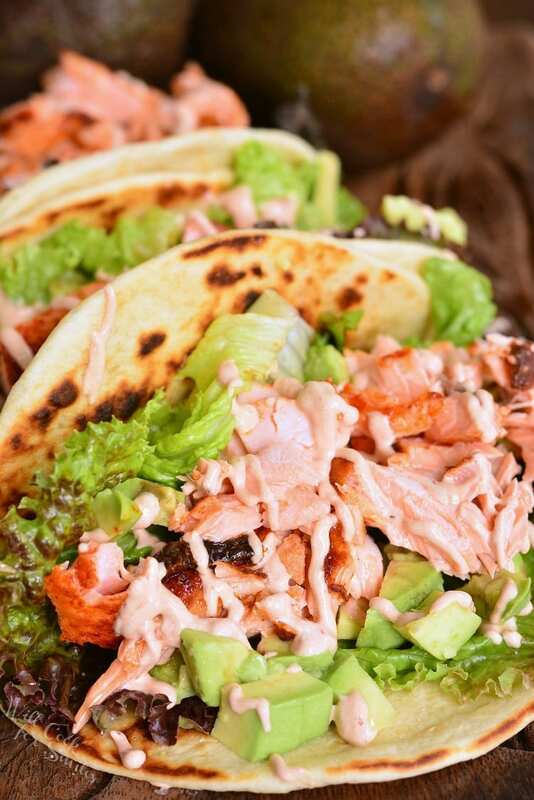 Tacos are simply assembled with some crunchy lettuce, avocados, salmon, and then topped with chipotle pepper cream sauce. I’ve been dreaming about some salmon tacos for week! Okay, maybe not weeks since I can’t go more than a week without having some salmon, but it’s been a while. My son actually got me in the mood for some salmon tacos. He’s been eagerly trying new foods lately and talking about fish a lot. One day, he came up to me and asked me to make salmon tacos out of nowhere. Until now, he’s only tried fish tacos so I was super excited about this request. I ran out and got a big, juicy piece of beautiful Atlantic salmon. When deciding on flavors, I went spicy because my little guy and I like some spice and I love the smokey, spicy flavors in Chipotle Peppers in Adobo Sauce. 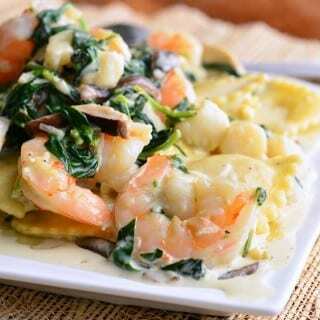 It adds a nice flavor to tacos in salmon and in the cream sauce on top. Oh well, more salmon tacos for me and cooked salmon held very nicely in the fridge so I could reheat it and make more tacos the next day. When baking salmon, start by lining the baking sheet with aluminum foil or parchment paper so that salmon doesn’t get stuck to the baking sheet. 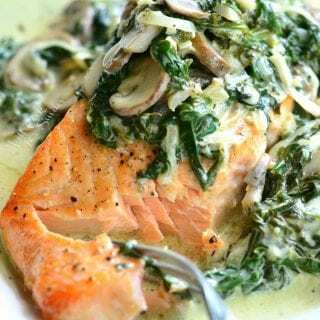 Baking time for salmon always varies depending on the size and thickness of salmon. Salmon is best when it’s still juicy. If it’s overdone, it would be dry. Easiest way to check is salmon is done is by using a thermometer. 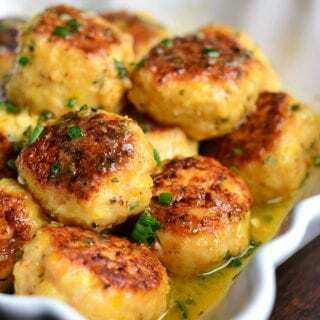 It is considered to be a safe temperature when it’s cooked to 145 degrees. When checking the temperature, insert it into the middle of the thickest part since that is the part that takes the longest to cook. Personally, I prefer my salmon to be done to 125-130 degrees, where it’s still juicy and tender. You can also check if salmon is done by touch to see how firm it is. This method takes a little more experience to recognize. When pressing on the thickest part of salmon, if it feels soft and easy to press down then it’s not quite done yet. If it feels firm, then it should be done. As I mentioned, recognizing if meat is done by touch takes a little more experience so to be safe, use a thermometer. 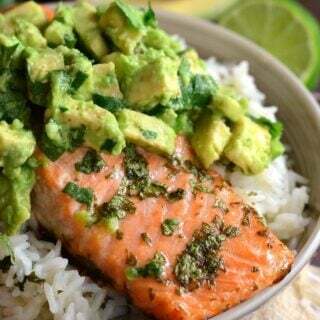 I recommend cooking salmon at higher temperature to less time because it results at juicier salmon. The best results I found was with baking salmon at 425 degrees. Tacos are so tasty when served on a warm tortilla. Heat tortillas in a preheated pan for a couple of minutes to give them a little color and a little crisp. What goes with salmon tacos? 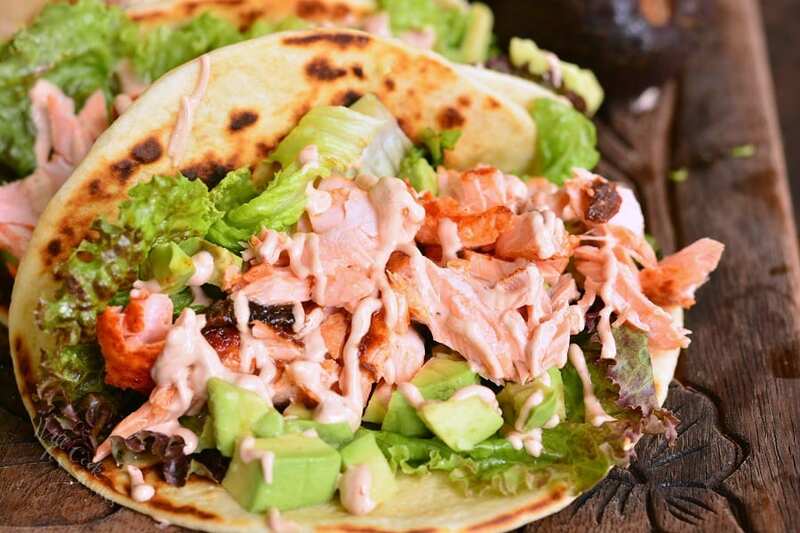 There are many things that you can add to your salmon tacos that will compliment the taste. 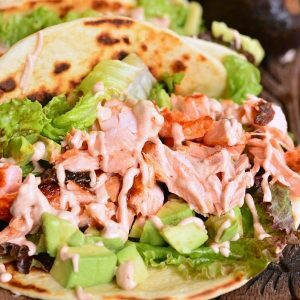 The best ingredients to add to tacos are the ones that will enhance the salmon instead of completely overwhelming them. I recommend using ingredients like avocados, lettuce, cucumber, and tomatoes. A few jalapeno peppers can add more spice to the tacos. Decide if you want to take seeds out or leave them it since seeds contain most of the spice. You can also add a few thinly sliced shallots. I love shallots because they are sweeter and have a hint of garlic flavor. If you don’t want to miss any new recipes, subscribe to e-mail or follow me through my social media channels! 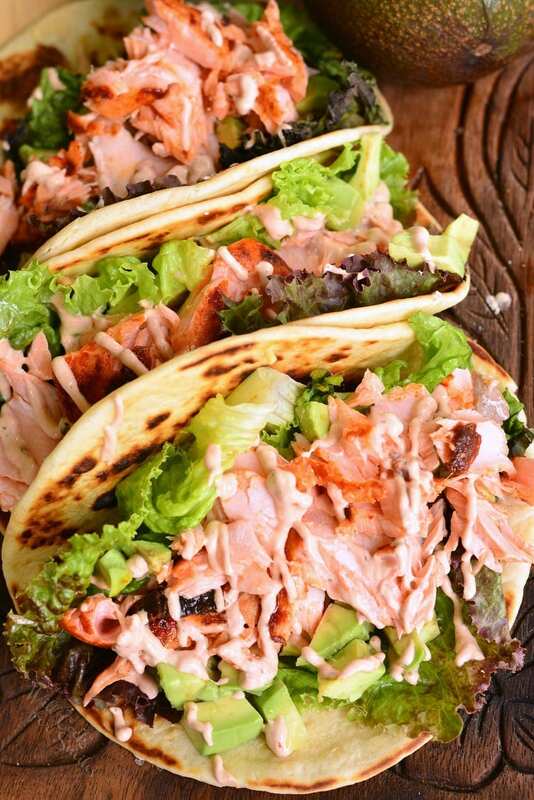 Easy salmon tacos made with oven baked salmon. These tacos are ready in 30 minutes. 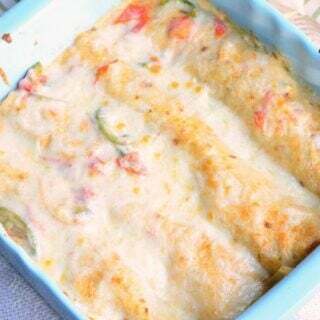 Salmon is rubbed with a mixture of Chipotle Peppers in Adobo Sauce before it's baked and tacos are drizzled with chipotle pepper cream sauce. Preheat oven to 425 and line a baking sheet with aluminum foil (or parchment paper). Rub salmon skin with a little bit of oil and place it in the prepared baking sheet, skin down. Mince chipotle peppers in adobo sauce and mix them with more adobo sauce, lime juice, and salt. Rub salmon with chipotle pepper mixture all over. Once salmon is done, use a fork to flake off salmon meat off the skin. Optional: while salmon is cooking, you can heat tortillas in a hot cooking pan. Heat tortillas on each side for about a minute. Assemble tacos by adding lettuce, thinly sliced shallots, and avocado meat to tortillas. 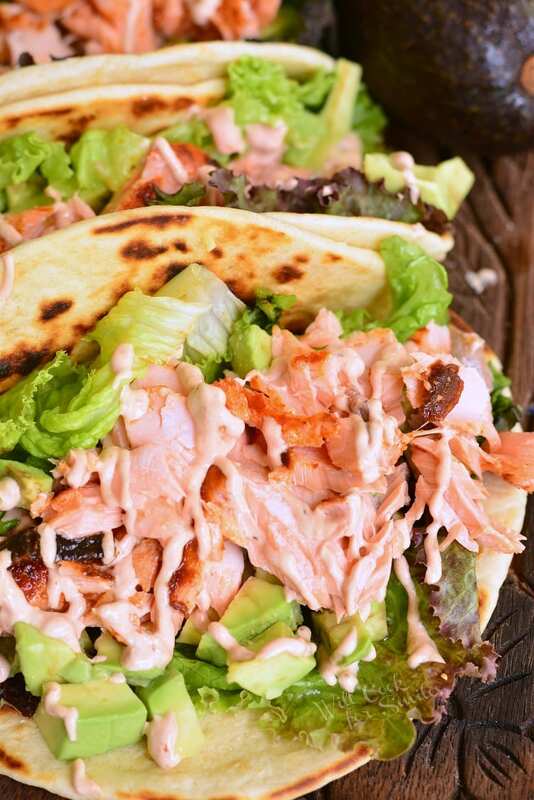 Divide salmon meat among the six tacos. 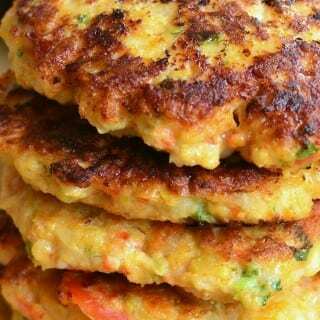 Combine ingredients for the sauce in a small blender and pulse them together. Easy way to drizzle the sauce over the tacos is to add it into a small zip-lock bag, cut off a little tip and squeeze to drizzle the sauce over tacos. Note: if you don't feel like using a blender over a small amount of sauce, you can mince the chipotle pepper finely, mix the sauce ingredients, and spoon sauce over the tacos. The Chipotle pepper cream sauce calls for “2 chipotle pepper in adobo sauce”, I am familiar with the small cans of chipolte in adobo sauce. Does this mean I pull out 2 peppers from the can and use those? Or should the recipe say something like ‘2 teaspoons of chipolte pepper in adobo sauce’?